Even More You Can Do to Bring AMC and OLTL Back! 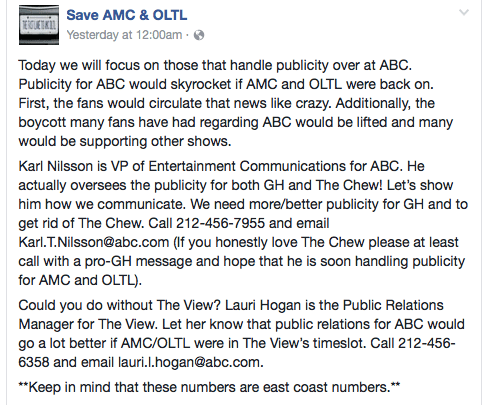 The tireless, shrewd folks over at Facebook group “Save AMC and OLTL” (SAO) yesterday posted another set of tasks faithful “All My Children” and “One Life to Live” fans can perform to resurrect those soaps! There’s No Such Thing as Bad Publicity–Or Is There? The current set of assignments, if you will, SAO suggests involve approaching ABC Disney (ABCD) from a publicity-related angle. Any business thrives or fails based on how it is perceived by the public. This is especially true of Hollywood, it seems. See all the numbers and emails you need in their post below! Don’t believe the people who, for whatever reason, feel the need to vociferously insist that AMC and OLTL can’t be resurrected. You loose 100% the shots you never make. Yes, you read that right. We here at Soap Cities just made a sports reference. Read our other articles about SAO’s tasks. Here’s a link to one, which contains a link to another. *This is a picture of the post. If you have trouble viewing the text, visit SAO’s Facebook page, which is linked at the top of this article.